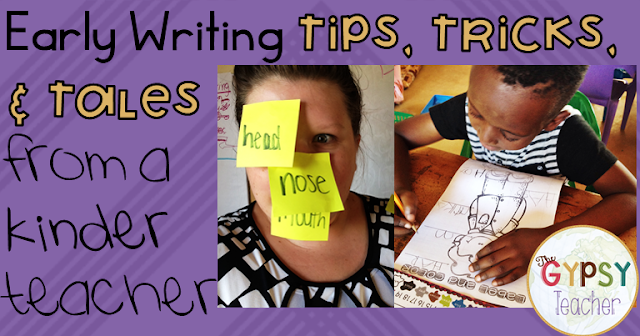 Teaching students how to write is a tricky process. I teach Kindergarten, and my students enter MAYBE knowing letters and some sounds, and exit reading and writing. But how do we get them from Point A to Point Z?!?! How do you encourage them to write without having them shut down at such a daunting task?! Well, I have some tricks and tips to make writing something your students LOVE, and make it easier for you to teach! In my opinion, the best way for the littles to start writing is by drawing their story and labeling the picture! Labeling pushes them to segment words into sounds, and put them on paper. It is a STRUGGLE at first, and requires lots of coaching, encouragement, and practice!! Over the next three weeks I will break the method to my madness down for you, starting with part 1 today!! This activity is low-prep and HIGH-impact. All I did was write the parts of my body (eye, leg, elbow, hand, nose, hair, etc.) on sticky notes, and stuck them to my whiteboard. One KEY here is to have enough labels for each student to label one part. Then, I challenged my students to label me! They chose a sticky note, TRIED to read the word (I had to help- as a lot of these words are hard for this age! ), and stuck it to the right part of my body. Giggles ensued every time they labeled me, especially when the labels would cover an eye, or my mouth! Not only was this a FUN and MEMORABLE lesson- but it was great to introduce them to labeling, and show them that EVERYONE can label! Idea Credit goes to the lovely Cara- The First Grade Parade! Come back next week for part two...guiding students to label with some themed stories, slinkies, and s'more! :D In the mean time, pin this image so you can reference it later and share it with friends! 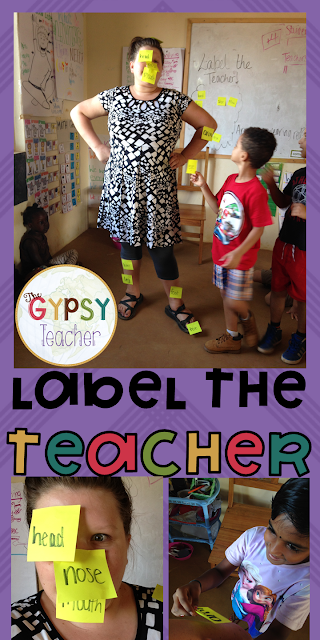 You can also get ahead of the game by heading over to my TpT Store to check out all my labeling resources: The Gypsy Teacher. It looks like everyone had a lot of fun, and completely forgot that they were learning - awesome lesson! As we all know the kids are very much curious in their early ages of educational activities as well as in social interactions among the masses. It does not seem unreasonable to suggest that one of the finest process flows and techniques to make the little bees know the words plus the new knowledge. Labeling the teacher is truly an encouraging way learning anything along with intrigue them write the word or sentences.